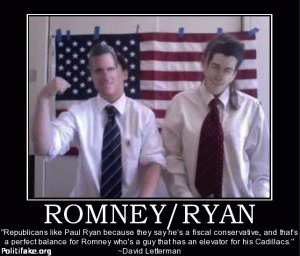 Republicans like Paul Ryan because they say he's a fiscal conservative, and that's a perfect balance for Romney who's a guy that has an elevator for his Cadillacs. david letterman has stopped giving a f*ck. martha stewart supplies the deviled eggs, dave supplies the ! evil dave letterman calls an adoption agency to adopt a black child, light-skinned preferably. 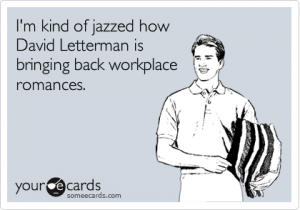 I'm kind of jazzed how David Letterman is bringing back workplace romances. 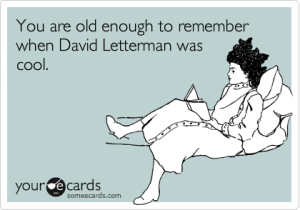 You are old enough to remember when David Letterman was cool. letterman's constant and relentless torture of john mccain must make vietnam feel like a .
i want to do to you, what david letterman wants to do to barack obama. 10. In several places on your tax forms, hes written, "Give or take a million dollars." 9. Tells you to put all your money into British cattle futures. 8. You notice that his "calculator" is just a broken VCR remote. 7. Insists that there is no such number as four. 6. He laughed at Bob Dole background check (I am sorry - thats a sign he is hypnotized). 5. Counts family of squirrels living in your yard as dependents. 4. Advises to save you postage by filing your taxes telepathically. 3. Instead of a CPA license, hes got a framed photo of a shirtless Alex Trebek. John Kerry speaks French, but he tries to avoid it. So, if a reporter asks him questions in French he'll pretend like he doesn't understand. Bush, on the other hand, has the same problem with English. John Kerry said that a lot of world leaders want him to be the president and the Bush administration said, 'Yeah, well, like who?' and John Kerry said, 'Well, I can't say really.' So, now they're really hammering John Kerry and listen to this, the only name he could come up with? Queen Latifah. John Kerry says the 'W' in George W. Bush stands for 'Wrong.' But he still can't explain what John Kerry stands for.